For some weird reason, I had a hankering for Gnocchi the other night and decided to get a tiny bit creative with it. Normally, I just boil it and serve a yummy meat sauce over it. Delish! Not tonight, folks!! Here’s somewhat fancy looking dish that came together quicker than the amount of time it takes to bring 2 quarts of water to a boil. Seriously. We’re talking minutes here, friends. Minutes. Boil 2 quarts water and cook frozen gnocchi according to package directions (usually 3 minutes – do NOT thaw the gnocchi). During the last minute of cooking, add asparagus pieces to pot to par boil. Cook for additional minute and strain. 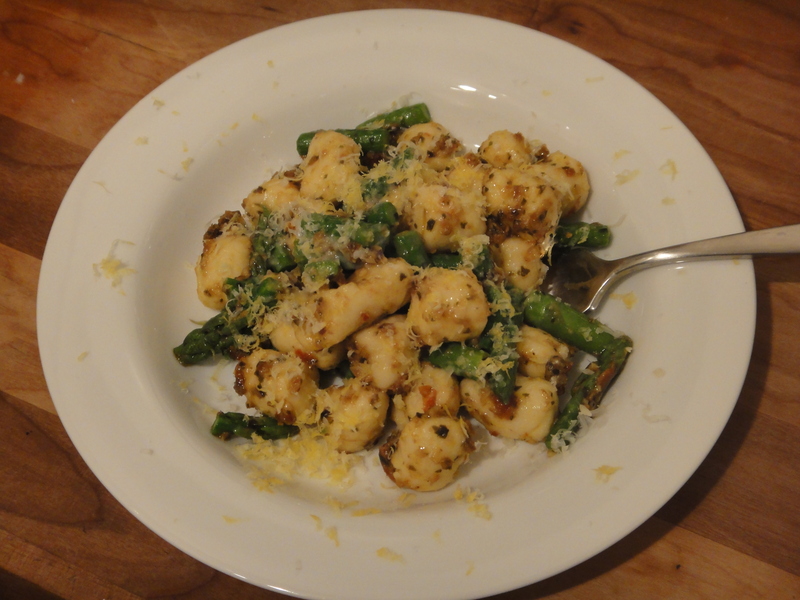 Return gnocchi and asparagus to pot and stir in pesto. Serve immediately topped with freshly grated Asiago and lemon zest.